This early short starring William S. Hart lacks the complexity of his later features, but still differs from the more generic Westerns of the era by presenting a decidedly unusual storyline for its star. Hart presents a moral tale in which the simple values of the frontier are contrasted with the corrupt climate of the urban Midwest. The movie opens by introducing the villain (John Davidson), a crooked mine promoter and his innocent stenographer, May Dawson (Clara Williams), who Davidson seems unduly interested in. Then the scene shifts to the West, where Hart as “Bat” Peters rides into town and defends an old drunk against a bully at a bar, then goes to check his mail. He has a letter from the promoter, who is interested in buying his mine. He suggests bringing samples of the ore to Chicago with him. Bat does so, and he and May make eyes at one another when they meet, and she suggests he room at her mother’s boarding house. Meanwhile, the crook decides to swindle Bat out of his mine, and makes plans with a small gang of hoods to pull it off. However, May hears the details of their plan, so she is kidnapped and held in a small room while the plan is put into action. Bat signs over his mine in exchange for cash and a “bogus Westerner” is introduced to show him the town. He is coaxed into a crooked poker game, with the intention of cheating him out of the money he’s been paid for his property. However, Bat sees the others trading cards and holds them at gunpoint. In trying to get out, he stumbles into the room where May is held, and then a fight breaks out as he tries to rescue her. The police, summoned by gunshots and a fire Bat has started, arrive, and take the crooks into custody. Bat and May go back to her mother’s house and he invites her to join him in the clean air of “the only land I understand.” The end. Pardon me ma’am, but is today the 23rd? I was a bit surprised to see a story set in Chicago starring William S. Hart. He’s still an upright cowboy though, so I guess it’s OK. It’s sort of a reversal of movies like “Wild and Woolly” where Douglas Fairbanks plays an easterner who goes West to find himself. The director seems to have been concerned that we would lose track of what day it was, because there’s a large calendar on the wall at the office that shows the date clearly, and it changes as the story moves from one day to the next. This movie, like “The Arizona Wooing,” was produced by the New York Motion Picture Company’s “Broncho Films” but there’s no obvious attempt to play on Broncho Billy this time. Hart probably wouldn’t have stood for it, although it occurs to me that Billy’s Essanay Company was located in Chicago, the den of evil in this movie, so there may have been a sly comment at work there. There isn’t much going on with the filmmaking here, mostly pretty standard shots and editing for the period, although there’s an insert shot during the poker game of one player’s hand passing a card to another, followed by a closeup of Hart glaring as this happens, so that at least there’s some use of technique. Bat seems to get off awful easy after shooting several men and starting a fire in the warehouse, but I suppose May’s testimony would have some influence on the police. Anyway, it’s not Hart’s best work, but it’s interesting to see where he came from. I have not found this movie available online for free. If you do, please comment. This live-action documentary short from the Ford Motor Company is quite different from the animated political cartoons we’ve seen from them in the past, but it still has a basically political message. In this case, it’s a positive one about re-integrating wounded veterans in the workforce and American society. This early short by D.W. Griffith was shot in California and adapts a highly popular novel which had come to be associated with the myth of Californian conquest. Although this is one of the longest movies released that year, Griffith was clearly feeling the constraints of the short format in trying to tell such a large story. The movie begins with a Biograph title card, which includes the subtitle “A Story of the White Man’s Injustice to the Indian.” The next card informs us about the source, the novel by Helen Hunt Jackson, and the fact that the movie was shot “on location” in Camulos, California, “the actual scenes” where the novel is set. 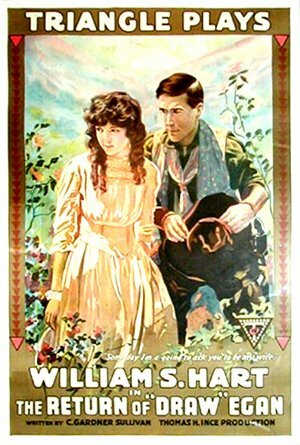 The first shot shows Ramona (played by a very young Mary Pickford) and her meeting with Alessandro (Henry B. Walthall), one of the Indians who works at her stepmother’s estate. Ramona is sewing, and as the Indian workers file past, Alessandro notices her and is struck by her beauty. Ramona goes into the church to pray, and Alessandro follows her. An intertitle informs us that the next scene is “the meeting at the chapel,” in which we witness their “meet cute.” Ramona also seems fascinated, but demure, and her stepbrother Felipe (Francis J. Grandon) introduces them and then leads Alssandro away. The next scenes show their growing attraction, and we learn that Ramona has rejected an engagement with Felipe over Alessandro. But, when Ramona sees Alessandro playing guitar under a tree, she runs away in horror, running to the church to ask forgiveness. But, after praying, she returns to him and embraces him, only to be violently separated by her outraged stepmother (Kate Bruce). A sudden shift in the plot takes place as the next intertitle informs us that “The Whites” devastate Alessandro’s village. We see this event at a great distance, with burning tents visible from a cliff. The main focus of action is on Alessandro in the foreground, who emotes his loss with gestures. Now, Ramona’s stepmother tells her the truth: she is half-Indian herself. This makes her love for Alessandro a possibility, and she goes to him to tell him, after somehow “intuiting” the burning of the Indian village. Again, they embrace, and now Ramona chooses his life over her own, joining him in poverty and effective exile. At first, Ramona’s stepmother wants to send workers out to search for her, but Felipe calls it off, forcing the family to accept Ramona’s choice. We see a brief scene of domestic bliss for Ramona and Alessandro, and they have a baby, but soon the whites come back to inform them that they now own the land. Now, they are homeless with a tiny baby to care for. They wander out into the mountains, and soon the baby dies and Alessandro is driven mad. In this state, he runs into one of the whites, who shoots him down. Ramona is grieving over his body when Felipe arrives to take her home. The movie as shown is very hard to follow without some background information or familiarity with the novel. Felipe’s role is particularly obscure, but also the “intuition” that drives Ramona to Alessandro the second time and various other events are hard to deduce from the intertitles. Scenes like the eviction from their house seem to drag on, but there are big jumps in the plot as it proceeds. Still, the movie has some interest. I’ve always felt that Griffith worked better in a short format (in part because he refused to write scripts or storyboards in detail), and this movie shows some of his developing strengths as a director. There is good use of inter-cutting to set up simultaneous events, and suspense is effectively established, as when Ramona prepares to sneak out of her stepmother’s house and one wonders if she will make it. Pickford is quite early in her acting career, and while she doesn’t dominate the screen the way she will later, she manages some nice touches as Ramona, especially when she seems to be vacillating between guilt over her feelings for Alessandro and a desire to give in to them. Walthall, who would go on to become a very successful leading man, still seems a bit rough around the edges to me. There’s no denying his screen presence, but he seems to go in for gesticulating over facial expressions. A bit more subtlety on his part would go a long way toward making this more watchable. 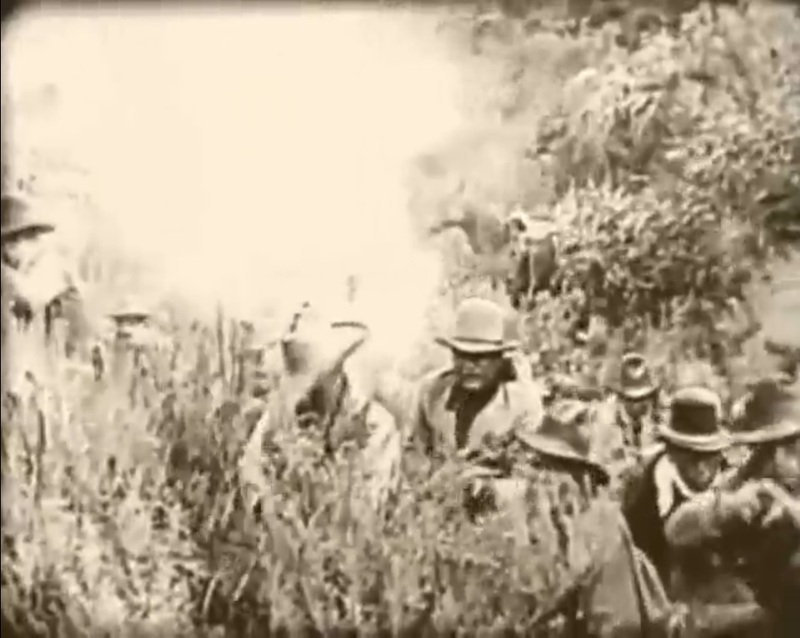 Once again, we have one of those D.W. Griffith movies that “prove” he wasn’t racist, because the whites are bad guys and the Indians are held up as noble. The problem with this is the degree to which the myth of the “noble savage” is bound up in American colonialism and the fact that this movie makes no attempt to depict the reasons behind the white people’s actions and the degree to which they are motivated by American values into attacking and victimizing the indigenous people. Reviewers at the time noted that it failed to truly transmit the intended message of the novel, focusing only on the elements of tragic romance that transcend race and situation. Undeniably a movie of historical interest, it may not live up to its reputation as a classic. This short film from Georges Méliès fits in with other entries from him in our “history of horror” (continued each October on this blog). He uses a supernatural theme to reproduce a kind of magic-show, using the tricks of cinema to produce effects that would be difficult or impossible on a live stage. Méliès stands at the center of a small, sparsely decorated stage, holding a large wreath. He puts his head through the wreath as he bows, then hangs it from a string so that it is about the height of his head. He demonstrates that there is nothing inside the wreath again, then waves his hands below to show that there is nothing there either. Now he makes magical gestures and the image of a demon appears inside the wreath. Méliès shakes his head disapprovingly and then gestures to make the demon disappear. The images inside of the ring first appear as fuzzy, out-of-focus blurs and then come into focus. The second image is that of a young woman. Méliès bows to her and she fades in and out once before being replaced by an image of Méliès. The two Méliès-images act independently, showing that this is a multiple-exposure. After he makes his duplicate image disappear, Méliès once again puts his head through the now-empty wreath to take a bow. This is a pretty early use of double-exposure images in film (but see also “The Four Troublesome Heads” from the year before) and Méliès handles it well. I thought it was interesting that his “spirits” fade in and out instead of simply appearing fully-formed. It reminded me of a pre-HD television image coming into focus, but obviously Méliès wouldn’t have had that in mind. I suppose that this effect might be typical of mediumistic representations of contacting the other side – at first the connection is imperfect, but the medium can improve it. At any rate, any kind of a fade at this time was a deliberate in-camera effect, and in this case he (or his cinematographer) must have been throwing the camera out of focus deliberately, then refining it while shooting. Just goes to show that things we take for granted required skill and planning in the early years of film. Roscoe “Fatty” Arbuckle directs and the new talent of Buster Keaton gets a shot at a bigger role in this 2-reel slapstick comedy from Comique. While it builds on older gags and situations, it shows a definite development in the comedy troupe’s abilities and cinematic imagination. The movie begins with a typical Arbuckle situation. He plays “Mr. Rough” (hence the multi-tiered pun of the title), a married man whose mother in law (Agnes Neilson) has come to visit. He is hiding in the bedroom while wife (Alice Lake) and mother take their breakfast. He dozes off with a cigarette in his hand, starting a fire on the bed. When he comes to, he stares blankly at the fire for a while, then walks out to the kitchen to fill a teacup with some water, which he then leisurely brings back to the bedroom and tosses on the raging flames. He goes to repeat this, but is distracted by the pretty maid (I think it’s Josephine Stevens), who he tries to kiss, and then he ends up drinking the water! By this point, wife and mother have become alerted to the situation, and they raise the alarm, causing a nearby gardener (Buster Keaton in a beard) to supply Fatty with a hose. He sprays everyone but the fire, eventually drenching the bedroom so much that fire simply cannot continue. While all of this has been going on, and inter-cut with it, the help have been engaged in slapstick shenanigans. Apparently the cook (Al St. John) also has an interest in the maid, but she isn’t interested in him, and kicks him into a pan of white goo, possibly a future cake that is now spoiled. At table, Fatty entertains the maid with a little bread roll fork-dance that Charlie Chaplin fans will find familiar. Then, her real love interest shows up in the form of Buster Keaton in his primary role as a delivery boy. He does several impressive pratfalls to introduce himself and starts throwing things at Al, resulting in more chaos in the house. This soon escalates to Buster chasing Al through the house with a knife, and Fatty become involved in throwing household objects at both of them. Mr. Rough eventually throws both of them out and they are arrested by a passing policeman when their fight spills into the yard. Mr. Rough consoles the maid, tending to her injured ankle – until the wife and mother-in-law return. They immediately show their wrath, mother-in-law choking Fatty, and wife firing the maid. Now Fatty has to take on the domestic tasks of the household, preparing for dinner company – a pair of “Dukes” (who are actually robbers) are coming over. Meanwhile, Buster and Al are offered jobs on the police force because the cells are all full. Fatty now does several of the “funny cook” gags we’ve seen in “The Waiters Ball” and elsewhere. He chops bread with a fan, puts out the table settings by carrying it all in the tablecloth, and pours gasoline all over the steak. Soon, the dinner degenerates into chaos, which gives one of the thieves a chance to sneak into the bedroom and steal a string of beads. Unfortunately for him, he is observed in this act by a plainclothes detective who has been following the phony aristocrats. He calls the station and Buster and Al are (of course!) called in to apprehend the miscreants. They now do their best tribute to the Keystone Kops, especially Buster, whose oversize helmet keeps falling off as he tumbles over fences and down slopes to rush to the scene of the crime. Meanwhile, the detective has recruited Fatty, and tries to hold the “Dukes” at gunpoint, but instead they make a break for it and he and Fatty shoot wildly at them (and at pretty much anything) while they run madly around the house. The thieves run out into the street with the detective and Fatty not far behind, and they hide in a cellar while Fatty shoots at the detective accidentally. After their journey to the house is delayed when the delivery boy gets stuck on a fence, the new police recruits eventually arrive at the house just in time to unintentionally stop the fleeing thieves by bumping into them. Mr. Rough takes back the necklace and the thieves are taken to jail. Arbuckle often structured his 2-reelers as 2-part stories, as in this case, where the first part of the story is the fire and the fight among Fatty and his help and the second part is the dinner and the chase after the thieves. The two parts are only loosely connected: Having Al and Buster become cops in the middle defies logic, but it keeps the best clowns available for more gags in the second part. Other comedy directors of the time did similar things (think of Chaplin and “The Immigrant,” with part one on the boat and part two in the restaurant), but it seems to me as though Arbuckle was especially devoted to the structure, sometimes at the expense of coherent narrative. This was a fairly early entry in Arbuckle’s series of films with Comique, his own film company, with distribution through Paramount Pictures, and only the second time he had worked with Buster Keaton. Keaton, who had an extensive stage career as a slapstick clown from childhood, is clearly comfortable in front of the camera and working well with the team. His rivalry with Al St. John works especially well in the first half. Interestingly, unlike “Oh Doctor” and “Coney Island,” both of which came out later in 1917, he’s not particularly expressive here, even if he hasn’t quite become “Old Stone Face” yet. Although the movie, and especially the final chase, is clearly built on older work from Keystone, it also shows cinematic advancement. The scene with the bed fire is pretty much lifted straight from “Fatty’s Plucky Pup,” but here the cross-cutting with another comic storyline makes it funnier and more effective. I’ve mentioned the parallel between the second part of the film and the Keystone Kops, but again there’s improvement, both in terms of the comic timing and the use of camera angles. We get close-ups on the ridiculous-looking station sergeant that Keystone would never have taken the time to do, and one sequence of pratfalls is shot in long shot, with the actors appearing as silhouettes, which is lovely. There’s also a contribution to future movies, in the form of the “bread roll dance” Fatty does for the maid. He’s not really as amusingly sympathetic as Chaplin will be eight years later, but it does show how all of the comedy masters freely borrowed from one another. I think this is the funniest of the Comiques I’ve reviewed so far, and the most readily re-watchable. Georges Méliès is on familiar ground with this fantasy tale of the nighttime adventures of an exotic aristocrat. I doubt if his viewers learned much about India from this movie, but they were no doubt entertained as he intended. The movie begins on a standard proscenium set, decorated as the sleeping chamber of a Rajah. The Rajah himself (Méliès) sits upon an elaborate bed, he yawns and lies down, still wearing his sword and all of his clothing. A butterfly swoops into the room and disturbs his nap, fluttering about his head until he gets up and tries to catch it in a net. Failing this, he lies down again, but this time the bed and the entire room disappear, and he tumbles to the ground, finding himself in a wooded area next to a stone wall. He tries to sit on a bench, but it disappears and reappears across the stage. Each time he tries to sit on it, he falls down again. Then, as he tries to approach it a dead tree appears in his path. He tries to pull it up, but a devil’s head appears on it and it starts waving its limbs like arms. He pulls out his sword to challenge it and it turns into a man with devil horns, who grabs the sword and dances around to mock the Rajah. The Rajah tries to wrestle him, but he disappears in a puff of smoke. After recovering from this, the Rajah finds himself confronted by a woman in a robe. He falls to his knees and professes love, but the woman refuses him. She summons other women, similarly skimpily attired, and they do a dance that involves twirling and knocking the Rajah to the ground. The Rajah manages to get up and run away, but even more women join the chase and soon the screen is filled with faerie-like young girls. They form a circle around the Rajah and beat his head with sticks. He is led up a scaffold to be beheaded. He fights with the executioner, but suddenly finds himself in his room, beating on a pillow. He falls to the floor once again and looks around, realizing that the entire experience has been a dream. This is a pretty standard Méliès short, with the main character plagued by things that appear and disappear at random, unable to gain control of his situation, and frequently leaping and tumbling for comic effect. Like all of them, it has lovely sets and costumes, and a sense of playfulness that keeps it fresh. What stands out a bit is the scene at the end with all of the women running around the stage. Méliès rarely had so many extras – I think there may be more people on the stage at one time here than we saw in the parade for “Joan of Arc!” He always had an eye for spectacle, and obviously in this case, he was willing to go to the effort to achieve his vision, even for a simple trick film. This short movie from Edison seems to be a kind of reversal of “How a French Nobleman…” using various locations in Manhattan for a comedic chase sequence. I’m not familiar with either of the names in the title, which may mean I’m not getting the context of the movie. The opening shot shows a busy downtown sidewalk, with an awning as of a theater or nightclub in the foreground. A large group of well-dressed women come out from the doorway under the awning and pile onto a horse-drawn carriage. Some men climb onto the sides of the carriage as well, then it takes off down the street. The carriage drives down various streets, mostly through parks and wooded areas, and the Midtown entrance to Central Park is recognizable at one point. Along the way, they pick up a pursuer. A man with a top hat and a jacket is running after the carriage. The women wave their parasols at him, but it’s hard to tell if they are encouraging or discouraging him. At one point they drive past Grant’s Tomb, and he stumbles and falls, but the camera is slightly pointed away so we miss the pratfall he does. The camera pans slightly afterward to see him get up and begin his pursuit again. Finally, the carriage arrives at a large well-appointed building like an academy or school of some kind, and the women disembark. There is no sign of the man at this point. Although I don’t fully understand this movie, it is a good depiction of New York from the period. It’s interesting how it seems to become more suburban and woodsy as the carriage proceeds further North. Today, apart from the parks, most of this drive would be through heavily populated urban areas. Probably the movie would make more sense to an audience that knew what “Rector’s” and “Claremont” were, and I assume that the exhibitor would provide a narrative to explain the mysterious pursuer. As it is, it is of more interest in terms of architecture and fashion than filmmaking. Near the “Rector’s” opening, we see a building with a full-size ad painted on the side: a woman in Victorian dress looming several stories tall over the street. That’s an exciting image right there! William S. Hart returns to the screen with familiar Western tropes done in a mature and morally sophisticated manner. While not as unrelentingly dark as “Hell’s Hinges,” this movie confirms that early silent audiences already knew that cowboys weren’t just kiddie fare. As the movie begins, Hart is introduced as the title character, a wanted criminal with a price on his head. He has a sizeable gang of desperados with him, but he decides that the heat is too much and they should split up and “shift for themselves.” One member of the disbanding gang is Arizona Joe (Robert McKim), who “has a yellow streak a mile wide,” but hides it with bluster and bravado. Before they can go their separate ways, however, the posse catches up to them and chases them to an abandoned mountain shack they use as a hideout. There’s a pitched gun-battle, but several of the gunmen escape through a tunnel underneath the shack to a place where they’ve stashed horses. Arizona Joe is too timid to try this, and tries to sneak past the lawmen, but he’s captured on the way out. 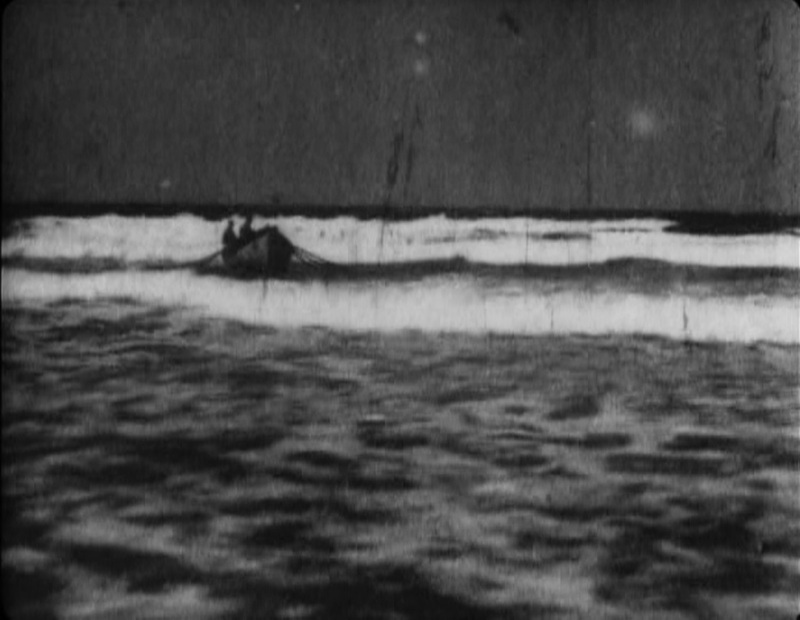 This short from Edison studios is actually an early example of editing, and it also takes advantage of the mythology surrounding rescue and safety activities as well as the drama of the open sea. We see a stormy ocean, apparently shot from the beach, as breakers are visible coming towards the camera. The scene is dark, and it is difficult to make out details, but eventually a small boat becomes visible amidst the waves. A cut brings the boat closer, and into clearer focus so that we can see oars off the sides, and with another cut we can see men in raincoats sitting on the open deck, rowing against the tide. A final cut shows the boat nearly pulling into shore, with the clearest view of the men aboard, who remain indistinct in the low-exposure. While many films up to this time had consisted of a single shot, this one stitches together several, although they are all taken from the same angle, resulting in a series of jump cuts. Each piece is only a few seconds long, resulting in much faster cutting that would be normal in the years afterward. The catalog entry for this movie emphasizes the accurate depiction of the “methods” of the Pacific Coast Life Saving Service, although all we really see is a tiny row boat being tossed about by the sea for a brief period. Presumably, it would have been shown with narration emphasizing the bravery of the men who ventured out in such conditions. Certainly, it looks like hard and dangerous work, from what we can see here.